Velvet Willow: She's out of surgery! Your and Willow's story is so INCREDIBLE! I'm in love with both of you!! I thought about her all day yesterday and am SO HAPPY to hear she is still reigning queen! Go Willow!! This gave me chills to read. How wonderful to hear you speak of Willow. You write so beautifully and transpose all of us to her and your world. It's no wonder we've all fallen in love with both of you. I'm going to guess that both Willow and Rachel Alexandra will be writing new chapters for their books while they are together. Wouldn't it be nice to be able to listen between them as they share their stories with eachother? For now, we will all be content with the news you have just brought. Rest well Shana and Willow. It is well deserved. Thank you doctors and staff at Rood & Riddle. Blessings to all. That is amazing news!! I am so happy for you and for Willow! This made my day to see this update. <3 Now you can rest! God is good! I'm just seeing Willow's story & I'm in love! Keep up the fight pretty girl! So glad to hear that Willow is doing so well. She is one special horse. I have a love for all animals and I find myself looking forward to your posts about Willow. Thanks and keep us all posted please! Thank you for keeping all of us posted while we waited for news. I know you must be incredibly exhausted, and you didn't have to take the time to post. Much hugs to you and Willow, and everyone involved. SO happy to hear there are such wonderful people in the world that take great care of our beloved animals. I have tears in my eyes and I don't know you or Willow. This is such a magnificent love story and I'm so happy it's having the happy ending it deserves. I'm so happy for you and I will keep you all in my prayers. God is good and our prayers were answered. She will fly through the next 3 months with your love and support. Get some much needed rest now. You'll have your baby home before you know it. That is the best news of the day , am so glad for you and Willow but knew that she was with the best. Many years ago I worked with Dr Riddle as his vet nurse and it was wonderful. I can now go to bed as living in France the day has been very long while waiting for news! Recover slowly and safely Willow. The power of prayer and love...it is simply amazing. So happy to read this great news. So happy for you and Willow! Will keep praying for her recovery!! Thank goodness! Thank Dr. Riddle! THANK GOD! Your latest post gave me chills. I am ecstatic to know that Willow's surgery went well, and I'm confident that she will recover. Think ahead to how sunny and warm and beautiful the world will be when she finally escapes confinement! What a glorious spring awaits you! And, Shana, you are to be commended for being such a thoughtful and caring person. May God bless you! Awww so wonderful sweet Willow and you are doing good. She is amazing. will keep the prayers heading your way. I'm so thrilled for you! Yesterday, I was reliving when my show horse kicked at my other horse when they were playing and hit the metal fence panel. His back leg was completely shattered and there was nothing that could be done. I'm so thankful that Willow could be fixed, and that you will have her home again. Prayers were answered!!! I've been following your blog silently through tears, never quite knowing what to say. I would want to say something, but in my head, the words always seemed so trivial and meaningless. I could offer no advice, as I own no horses. I've been around them all my life, yes, but never raised them nor cared for them on my own. I ride them as part of ever ongoing recovery (long story), but that's completely different. In the end these horses helped me overcome so much, rebuild my strength, learn to trust again, feel free again. Have HOPE again. What you are doing for Willow is all that and so much more. You are truly an amazing person. I admire so much about what you are doing here. May God continue to bless you and you family, and continue to strengthen Willow. Good luck on your amazing journey! Long live Queen Velvet Willow.....Queen of Florabella Farm! So happy for you Shana Rae! So thankful to hear the great news. We love Willow too! This is the best news of the day! Fantastic. I had no doubt she would pull through this. You can see the fight in her. I can't wait to see photos of her when she returns. Take a deep breath and try to relax. I know how it is when you are worrying over your horse. Such a large animal that is so dependent on us. . . it's hard. She made through and hopefully it's all uphill from here. I was thinking of her all day! Long live the Queen! Perfect sentiment. I don't know you personally, but I follow Willow's story (and yours too, of course.) At the risk of sounding strange, I think you're beautiful (inside and out), Willow is gorgeous and your pictures are amazing. I wish both you and Willow the best and keep on writing and taking pictures. You're very gifted and please know they make a difference in a very common persons life. Willow's story is so touching and the heartbreak of yesterday was tragic...so very glad the situation is looking positive. Please keep writing about Willow and taking those gorgeous photos of her. I forgot to ask... I also was wondering how Raven/Lucky Deluxe is? Was she ok as well? Will you keep Willow and Raven apart for now? I just wondered if she was hurt at all too. I was so busy worrying about Willow I had forgotten about Raven! 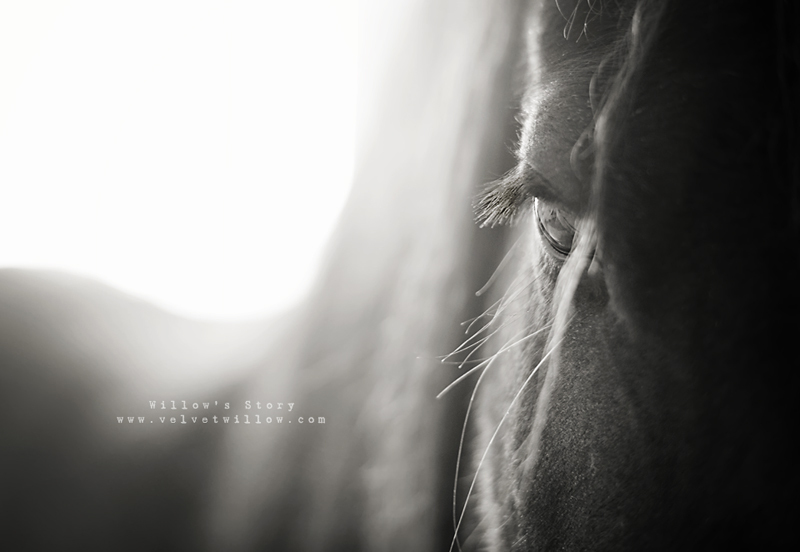 They are both such sweet horses I am hoping everyone is ok.
so so glad to hear this wonderful news about sweet Willow.. I have never met her.. but can tell by your words ( and love for her ) that she is quite the fighter and I know she will come through all these struggles so much stronger than ever before..
Oooh I just knew her story would go on!!!!! Long live the Queen, indeed. So thrilled for you all!!! thanks for sharing, the pics are amazing!! True love, God bless you.